The CoffeeShop Blog: CoffeeShop "Taryn" Digital Paper Pack! CoffeeShop "Taryn" Digital Paper Pack! I wanted to make one last paper pack for St. Patrick's Day. This one is a pretty floral version. Like all of my papers, you can use these personally or commercially, no attribution necessary! I am going to be posting a series of tutorials showing you how to create your own beautiful custom papers. I just finished up an action that creates seamless patterns with ease. I can't wait to share it! I use free public domain image and Photoshop or PSE to create all of my custom papers. If you are interested in creating your own gorgeous papers to sell or use personally and need to buy an affordable program to do it, I would suggest Photoshop Elements. Not only can you create amazing digital designs, you can also use my editing actions on your images. Right now PSE is only $60! I am an affiliate at Amazon so if you purchase Photoshop Elements through this link I get a small percentage of the sale (it costs you nothing at all) which goes toward supporting this site. Thank you! 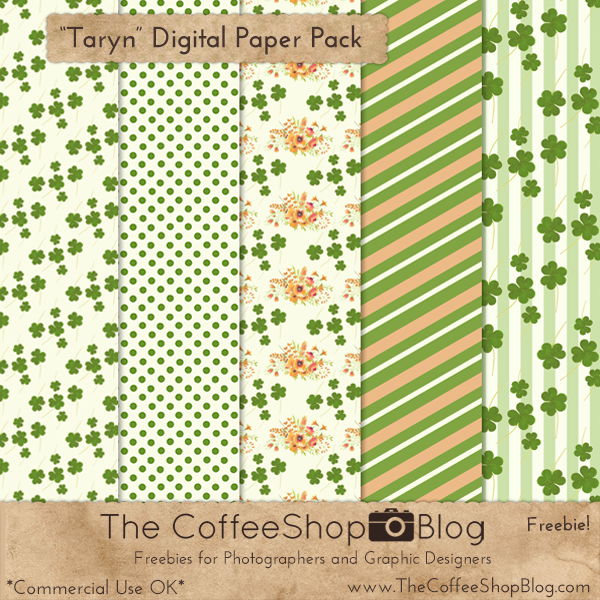 Download the CoffeeShop "Taryn" Digital Paper Pack! thank you so much for the great St Patty's Day papers. Another lovely set. Thanks so much Rita. Dear Rita, thank you very much for sharing your wonderful papers. Marina, you are so welcome!